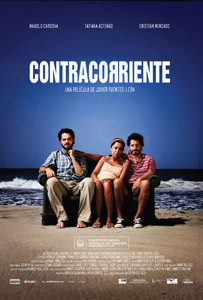 Contracorriente: Melodramatic Magic Realism | personal.amy-wong.com - A Blog by Amy Wong. Now I understand why Undertow has been winning audience awards everywhere, it plays with your bobito (heart). And comparisons with Brokeback Mountain seem to be inevitable, since they are both dealing with a “gay” thematic in a setting not usually linked to “gay behavior” and they both have to deal with extramarital affairs, but they are little alike. In Undertow, Miguel (Cristian Mercado) is a fisherman in the small town of Cabo Blanco, Peru, where he is having a baby with his wife Mariela (Tatiana Astengo). The model citizen, a good husband, and well-liked by everyone in town, no one knows that Miguel is having an extramarital affair with Santiago (Manolo Cardona), an artist who’s visited the place since he can remember. As the melodrama unfolds, writer/director Javier Fuentes Leon doesn’t really take us nowhere we’ve never seen before — if you’ve seen many LGBT-themed films that is, except with that bit with Santiago’s destiny, where the Magic Realism finally kicks in. Ultimately, the film is just a love story, which on one side makes you wonder how well the story would be received if it didn’t have a gay relationship at its core, and on the other side you’re presented with a gay relationship that’s as normal as any heterosexual one. Undertow will probably get placed next to other LGBT favorites in the following years — once more people get to watch it — right next to crowd’s faves like Brokeback Mountain, Shelter, Where the World Mine, Imagine Me & You, and Show Me Love. The acting is strong by the three lead actors, being able to carry the whole film in its 100 minutes of running time. The strongest moment in the film was perhaps better condensed in the song by Celso Piña featuring Cafe Tacuba, Aunque No Sea Conmigo, used in the trailer and the film for the line of “Quiero que seas feliz, aunque no se conmigo” (I want you to be happy, even if it’s not with me). Visually, the film delivers some hunting scenes — I still believe Ricardo de Montreuil (La Mujer de mi Hermano, Mancora) is visually better in his work with his advantage work on some very high profile music videos in Latin America… so how about a collaboration, guys? I’m pretty sure there was a Top50 Lesbian film, will add that here when I find it. Thank you for the update, has this been sent for Oscar consideration as Peru's entry?